Microsoft has announced that the final version of its Security Essentials anti-malware software will be out of Beta in the "coming weeks," pointing to a rollout of the free computer protection service in line with Windows 7. Formerly codenamed Morro, the anti-virus app replaces Windows' built-in Defender (it disables it in install) and offers protection against nasty little things like viruses, spyware, trojans and rootkits. 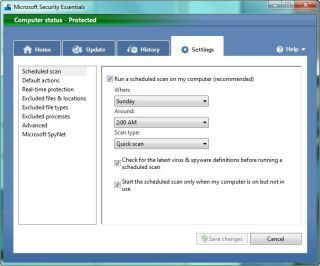 Users of the beta version of the software were emailed this week to inform them that the final version was imminent, with the email stating: "The final version of Microsoft Security Essentials will be released to the public in the coming weeks. "If you are running the older version of the beta (1.0.1407.0), we encourage you to upgrade to a newer version of the beta (1.0.1500.0). To ensure the smoothest possible experience, please follow one of these options." With the Windows 7 release date set for 22 October, it seems more than likely the full version of Security Essentials will be out in time. While it isn't the first time anti-virus software has been given away for free, having such a big name like Microsoft behind the giveaway will be enough to give the likes of Norton and McAfee a few sleepless nights.